Ran the four Tanner crab RNA samples that I isolated yesterday on the Seeb Lab Bioanalyzer 2100 (Agilent) using the RNA Pico 6000 Kit. RNA denatured at 70C for 2mins and stored on ice. RNA ladder aliquot was from 20160826 by Hollie Putnam. These results look great to me. Clear, defined peaks/bands, representing ribosomal RNA. Oddly, one sample (crab_506) appears to be shifted, relative to the other three, despite exhibiting the same peak/banding pattern. Not sure what would cause something like this; contaminants? Regardless, we finally have clean RNA and have a usable Bioanalyzer profile to use for reference for crab RNA. NOTE: The lanes marked with red on the gel representation image indicate that a ribosomal integrity number (RIN) could not be calculated. This is to be expected! The RIN is based on the expectation of two rRNA bands. The anomaly is sample crab_451 – a RIN was actually determined for that sample! Will likely move forward with additional RNA isolations using the RNeasy Plus Kit (Qiagen). This entry was posted in Miscellaneous and tagged bioanalyzer, Chionoecetes bairdi, electropherogram, RNA, RNA Pico 6000, tanner crab on 1 August, 2018 by kubu4. Made 2μL aliquots of the ladder in 0.5mL snap cap tubes. Samples were boxed, labeled, and stored @ -80C (Rack #9). 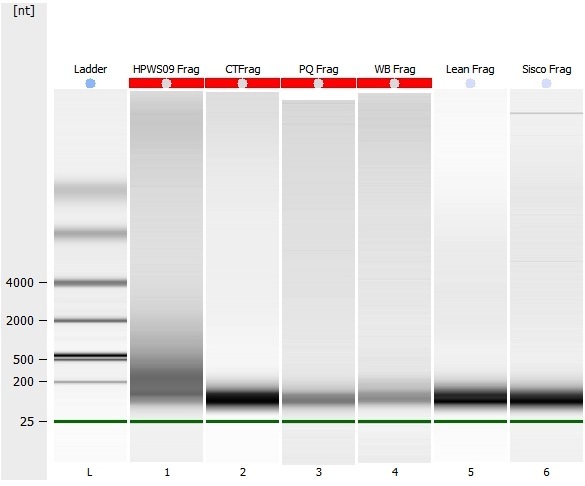 This entry was posted in Reagent Prep and tagged ladder, RNA Pico 6000 on 18 December, 2015 by kubu4. This entry was posted in Miscellaneous and tagged 1 G/O HPWS09, bioanalyzer, CT, gel, lake trout, Lean, library prep, Pacific herring, PQ, RNA, RNA Pico 6000, Sisco, siscowet, SOLiD, SOLiD libraries, WB, yellow perch on 29 March, 2010 by kubu4. Samples from 20091203. 0.5uL was removed from each and transferred to separate tubes and diluted to < 5ng/uL for subsequent Bioanalyzer analysis using the Pico chip. Samples were fragmented using RNase III according to the Ambion WTK protocol and then cleaned up/concentrated using the Invitrogen RiboMinus Concentration Module according to the Ambion WTK protocol. Total, mRNA and fragmented mRNA from each of the four samples was run on the Pico chip with the Eukaryote Total RNA Bioanalyzer protocol. The 2L tot (total RNA) and 3L tot (total RNA) samples are clearly very good quality. 2L tot does exhibit some very slight degradation, though. 4L tot (total RNA) and 6L tot (total RNA) show a much greater degree of degradation. 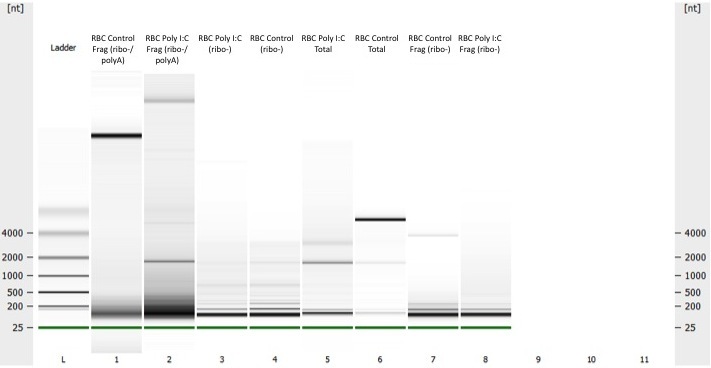 All mRNA samples show complete removal of any trace, contaminating rRNA. The fragmented samples (the last four samples on the gel image above) all appear to be perfect. 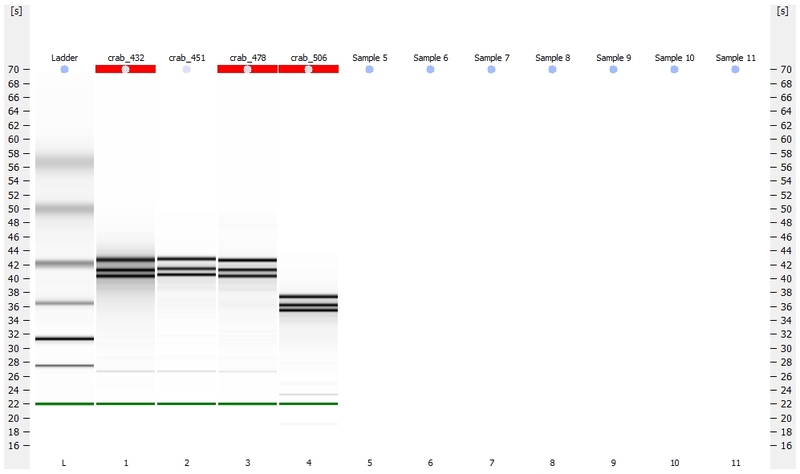 The 4L frag sample simply has less RNA loaded and that is why it is not as dark as the other three fragmented samples. Despite the degradation in the 4L tot and 6L tot samples, the fragmentation profile looks good and we will proceed with making the cDNA libraries for those samples. This entry was posted in Miscellaneous and tagged 2L, 3L, 4L, 6L, bioanalyzer, gel, mRNA, mRNA enrichment, NanoDrop1000, Pacific herring, Ribominus Concentration Module Kit, RNA fragmentation, RNA Pico 6000, RNA quantification, total RNA, Whole Transcriptome Analysis Kit on 7 December, 2009 by kubu4. Submitted Rick’s trout RBC samples to FHRC for bioanalysis using the PicoChip for use with the SOLiD WTK. Submission sheet is here. This entry was posted in Miscellaneous and tagged bioanalyzer, gel, library prep, RBC, RNA, RNA Pico 6000, SOLiD, SOLiD libraries, trout on 29 September, 2009 by kubu4.